If you’re looking for some of the best pizza in Sin City you must try Las Vegas’s best kept “secret pizza place”. Located on the 3rd floor in The Cosmopolitan Hotel you can find some of the most amazing fresh pizza dough, toppings and ingredients made fresh daily. 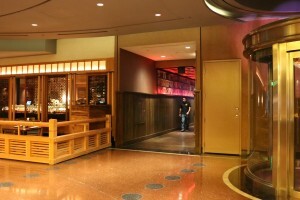 The entrance is a bit hard to find, with no sign in front which gives it an exclusive New York pizza place environment. This hidden gem is open until 5am but you will have to ask around for it. After passing album covers from Frank Sinatra, Elvis and other music icons on the wall, you’re spilled into a tiny, standing room only place. There is a high-top counter to stand at while eating a slice and a few mismatched stools. In addition to soft drinks, a few select beers are available. This Secret Pizza will definitely have some of the best deals on the strip for quality pizza; I’m not sure there is a better pizza spot and they will always leave you wanting another slice.